Diamond Details: Round brilliant cut white diamonds of G-H color, SI1 clarity, of excellent cut and brilliance, weighing .19 carat total. Earring Details: Simon G 18k rose gold design from the Organic Allure Collection with electroplating. Measurements: 38mm in length and 14.5mm at its widest point. 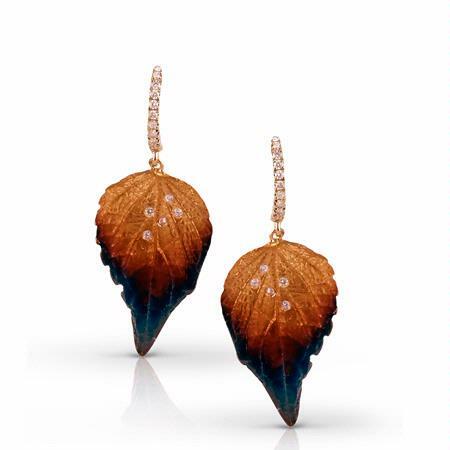 This stunning Simon G 18k yellow, rose, and brown gold dangle earrings from the Organic Allure Collection with electroplating features round brilliant cut white diamonds of G-H color, SI1 clarity, of excellent cut and brilliance, weighing .19 carat total. These diamond earrings measures 38mm in length and 14.5mm at its widest point. Please call for pricing 1-800-790-6980 or 1-212-302-2863.